General Relativity states the geometry of spacetime depends on average mass-energy density. For a Euclidian or flat universe the average mass-energy density is defined as rc which is also known as the critical density. The curvature (K) of a flat universe is zero when the ratio of mass-energy density to critical density (W) equals 1. Similarly, if the ratio of average mass-energy density to critical density is greater than 1 then the Universe is considered closed having positive curvature like a sphere. Finally, if the ratio of average mass-energy density to critical density is less than 1 then the Universe is considered open having negative curvature like a saddle. 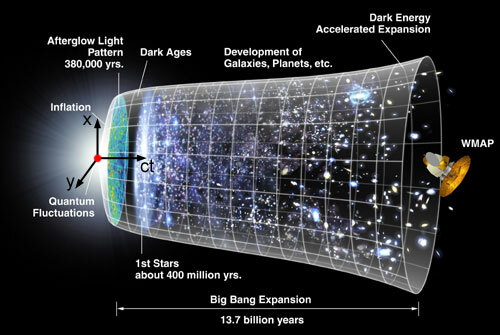 The present Universe is considered flat because the overall mass-energy density is very nearly equal to the critical density (rc) required for flat spacetime.